How does an internationally recognized star remain so humble? There’s no question – Shuvinai Ashoona has broken through the ranks of contemporary art to emerge as a genuine star, not just among Inuit or Canadian artists, but on the international stage. We couldn’t be more delighted for her. To watch Shuvinai at the opening of her “We End Up Dreaming” show overcome by all the attention, was so poignant and so unusual among artists of her stature. There was a festive atmosphere to the opening, with the tone set by a performance from former Bare Naked Ladies’ instrumentalist, Kevin Hearn. Shuvinai had been fêted the night before at the Power Plant as part of her Mapping Worlds exhibition there. A large contingent from the Power Plant were on hand at Feheley to continue the celebrations with Shuvinai, led by the director, Gaëtane Verna along with fellow Power Plant artists Omar Ba and Alicia Henry. 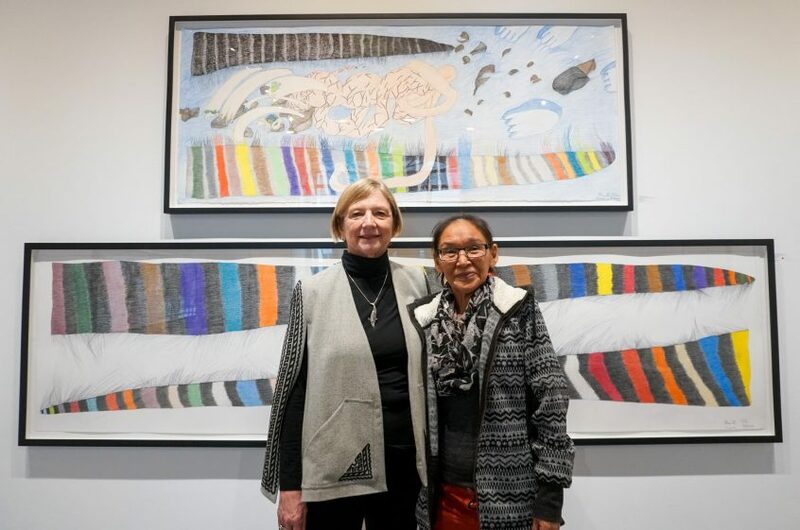 Also in attendance were Sarah Milroy, Chief Curator of the McMichael Canadian Art Collection and Niviput, the Inuktitut community radio show based in Montreal that covered the opening and interviewed Shuvinai. It wasn’t only Shuvinai’s presence and her dual solo shows that were causes for celebration. The big news was the awarding of the prestigious 2018 Gershon Iskowitz Prize to Shuvinai. Along with the prize comes $50,000 in cash, in addition to a solo exhibition at the Art Gallery of Ontario within two years. That means we can look forward to future visits and shows by Shuvinai in the near future. Yet one more cause for celebration. The Shuvinai Ashoona – We End Up Dreaming exhibition runs from January 26 @ 11:00 am – February 23 @ 6:00 pm at Feheley.